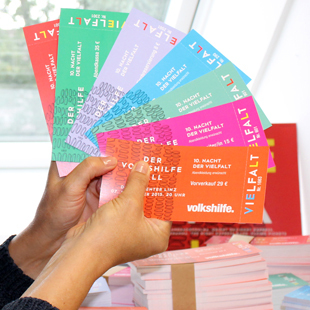 Sie sind hier : Volkshilfe OÖ > Volkshilfe > News > Nacht der Vielfalt – get your ticket now! Nacht der Vielfalt – get your ticket now! On November 7th we will celebrate the Nacht der Vielfalt – the Volkshilfe Ball. Tickets are now available. Don’t miss the year’s most colourful night and get your tickets now! Tickets for the Nacht der Vielfalt are availabe now! Place cards are only available in advance sale, prize: 8 Euros each. at all Ö-Ticket selling points (banks, tobacconists, ticket offices) and online at www.oeticket.com.